PAC International has amassed considerable expertise and experience in the design, installation and integration of avionics packages to meet a wide array of mission requirements. We represent a broad spectrum of avionics equipment manufacturers allowing our customers considerable latitude in their equipment options. These include an array of radios as well as navigation, flight control, optics, entertainment and special missions equipment systems to meet our customers’ specific needs. Additionally, we provide custom designed instrument panels and night vision goggle compatible cockpits. 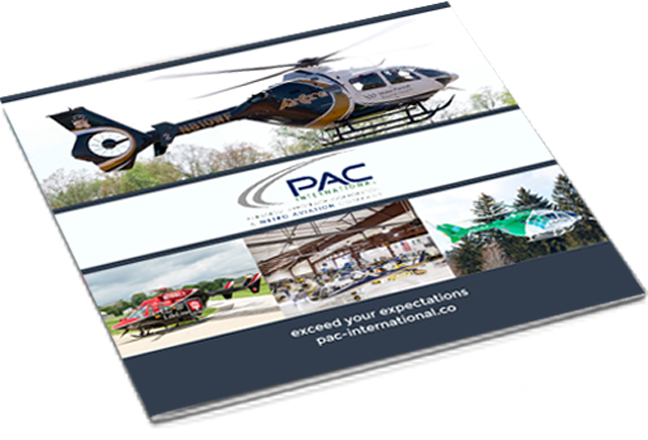 With the tremendous loads experienced by the dynamic components in their rotary wing aircraft, our customers rest comfortably knowing of the professionalism of the repair and overhaul staff at PAC International and the very high standards they set for themselves. To be sure, the components are completed to the standards set by the manufacturers and the FAA; however, our staff is extensively experienced and has a dedication to quality that is unsurpassed in the industry. With an absolute commitment to the safety of our customers, our staff ensures each job is done right, the first time. With the vast experience gained from having successfully undertaken over 1,589 helicopter completions and customizing jobs, we are in an unsurpassed position to provide quality modification services for our customers. PAC International takes considerable pride in our ability to work closely with customers to understand their requirements and to then meet their expectations on schedule and at a competitive price. Mission specialties include law enforcement, emergency medical services, electronic news gathering, search and rescue, offshore transport, fire fighting and executive transport. While serving the rotary wing community for over 40 years as an FAA Repair Stations and a Bell Customer Service Facility, we have gained a reputation for providing highly responsive and professional maintenance services. Our maintenance services range from normal scheduled and unscheduled line maintenance to component repair and overhaul services. Our Airframe & Power Plant licensed mechanics are factory trained at Bell, Airbus and Leonardo and they are known for their dedication to performing quality work. Many rotary wing service providers don’t provide paint services. Others see it as another of their functions. At PAC International, it’s nothing short of a passion. This passion carries through from the management of the department to the very high standards they set for themselves, to the training and mentoring that takes place within the group and to the extreme attention to details that goes into each and every job they undertake. Many of our customers are quite willing to transport their aircraft considerable distances to partake in our unparalleled paint services. Our spare parts sales department is dedicated to meeting the demanding spare parts requirements of our customer, wherever they may be around the world. The experienced, responsive and resourceful PAC International staff goes far beyond the practice of interfacing with the spare parts systems and departments at Bell and the other manufacturers we represent. They go out of their way to also find alternative solutions to provide quality parts at competitive prices. They can also skillfully address the issues that arise with shipping, export documentation, letters of credit and the like.